Hostal Pangea, San Pedro de Atacama, Chile : Rezerwuj teraz! Cancellations or modifications of the stay up to 72 hours before the date of arrival to avoid charges. Send to email; otherwise, 100% of the reservation will be charged. At 23:30 common areas are closed. It is strictly forbidden to carry out, promote or encourage discriminatory acts against other passengers, visitors or employees of the hostel. It will be reported to the competent authority without the right to claim or refund monies. Las Reservaciones de grupos deben pagar la totalidad de la reservacón al momento del check in al hostal. Hostal Pangea, Central, free breakfast, low prices and good atmosphere make your stay an experience that you can not miss on your trip. 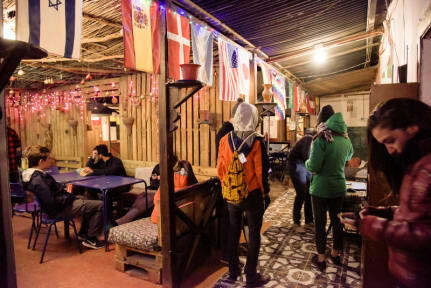 It is a hostel for young people or with a young soul, Located in the center of San Pedro de Atacama one block from the church of San Pedro de Atacama, just steps from the main street known as Calle Caracoles where guests will find restaurants, bars, Tour agencies and nightlife often. 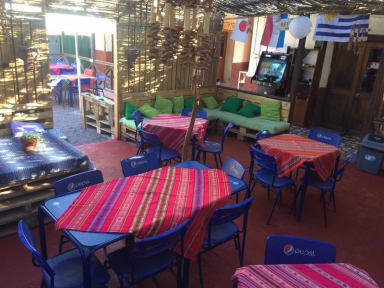 Hostal Pangea is located in Gustavo Le Paige street, in the corner with Calama street, only two blocks far away from the village museum and just some steps from the church of San Pedro de Atacama. Hostal Pangea is located in the historical center of the town and only five blocks far away to the bus terminal. Our rooms are more economical and also very spacious, ideal for passengers looking to save money with great comfort given the very large space of these rooms of colonial construction. Central, free breakfast, low prices and good atmosphere make your stay an experience that you can not miss on your trip. As free services for our passengers we have: Reception 24 Hrs; WIFI internet connection / computer with internet connection;Free city map; Lockers for shared bedrooms (in common areas); Gay friendly! ;Hot water 24 hours a day. ;Book exchange; Maid service in room all days; Bed linen and sheets in beds ;Ping Ping Pong table; Breakfast included in the value of your stay; Passenger Kitchen; and Camp Fires on weekends. Based on local tax laws, all Chilean citizens and resident foreigners must pay an additional fee (IVA) of 19%. To be exempt from this 19% additional fee (IVA) the payment must be made ONLY IN US dollars in CASH and a copy of the immigration card and passport must be presented. The passenger won’t be exempt from this fee when paying in local currency. In case of no show the invoice will be billed in local currency, including this additional fee (IVA).